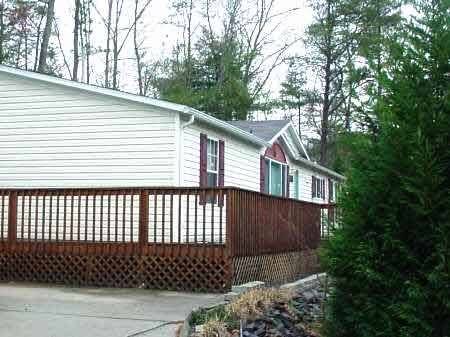 Robbinsville NC Mountain Manufactured Home with Double Garage for Sale. Near Lake Santeetlah, Fontana. Robbinsville NC manufactured homes for sale in Graham County NC. Robbinsville NC real estate for sale. Western NC Mountain creek, trout stream homes, log cabins near Lake Santeetlah and Fontana for sale. North Carolina Mountain homes for sale. 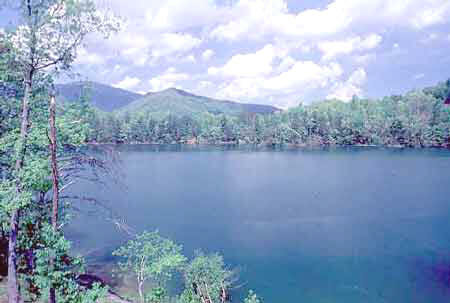 Lakefront log homes, cabins, waterfront homes, lake front homes, lakeside house, river homes, gated community golf course development homes in the North Carolina Smokey Mountains. Robbinsville, Graham County creek front houses, trout stream cabins, weekend getaway vacation homes in the NC Smoky Mountains. REDUCED Robbinsville NC Home for sale. 218 3BR/2BA manufactured home on permanent foundation. Split floor plan with gas fireplace in living room, central heat/air, vaulted ceilings, and double pane windows. Master bath with shower and garden tub. Large eat-in kitchen. Separate lines for phone and computer. Decks on 3 sides with back portion covered. Large 2 car garage and additional storage building. Dual security system, private well, immaculate landscaping with mature trees. Price REDUCED to $119,000.